United is bringing back free snacks. But seriously, remember when free snacks were a given and not something an airline was looking to be praised for? Oh man, Southwest! This does not give me warm fuzzies about flying out of Nashville (but I have no choice). After recently finishing Downton Abbey (can't wait for season 6!) I'm loving these English homes. These excuses *might* help if you're late or miss your flight - but don't hold me to it. An airline class WORSE than coach? It's happening. PS - My gut says it's not worth the 10-20% savings. I'm used to service fees and liquor tax - but charing for clean air? This is the ultimate travel accessory. I don't leave home without it! These shoes are ugly and hilarious... and I'm not sure they'll save that much time at security. How to pick the best airline for you! Working at 10,000 feet? Find out which airline has the best Wi-Fi. Thanks for NOTHING, American Airlines. Using the restroom should not be an "add-on" for flying! Luckily, some people agree. We're sitting tight for Christmas Day, I'm excited for a working fireplace and my lit up tree with a nice, slow morning and a warm beverage to go with it. What are you doing for Christmas? 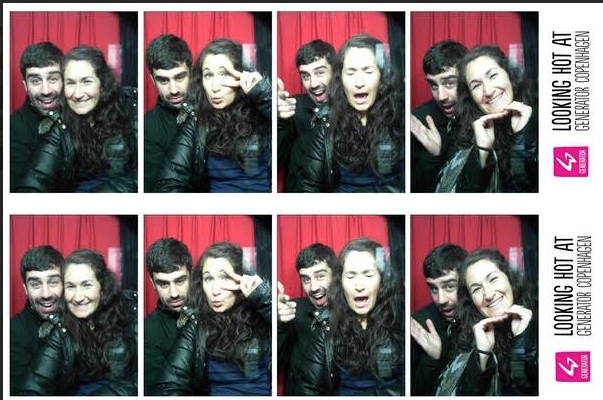 Here are a few links to our recent Euro-Trip if you missed them! Hope everyone has a great, festive week! Have you ever heard of Bruges? If you haven't you're definitely not alone. I had no idea where it was until Matt made me watch "In Bruges" (it's a very dark comedy - heavy on the dark, and the F word, so be advised if you've never watched it). BUT - one thing that stuck out to me in the movie is that the villain keeps referring to Bruges as a "fairy tale town" - he wasn't kidding. Bruges is so stinking CUTE! It's one of the only cities in Europe that never got distorted during a war or was victim to a massive fire. It's medieval charm is thick and many of the buildings are marked with the year they were built. We saw tons from the 1500's and 1600's, and even as early as the 1400's! Incredible. I mean, seriously. Can you even resist those little ginger bread houses? The town is covered with them. The Bed & Breakfast we stayed in was also quite dreamy, and an incredible price for such a beautiful room and amazing service! It was all decorated for Christmas which only added to its charm. The couple that runs the B&B were so lovely. If you ever find yourself in Bruges, I can't recommend the Huis Koning B&B enough. The beautiful tower in the middle of the main square. You can climb to the top (366 steps! ), there are a few stops on the way to inspect the bells and other pieces of history. It was fun and worth the climb. The view is wonderful! The staircase is very winde-y, there's no elevator, and it's the same stairs to go up or come down. But it's fun. If you cheated and took the elevator to the top of the Eiffel tower, you better clime the Belfort! Seriously, check out that staircase! Seems cheesy, but it's fun. 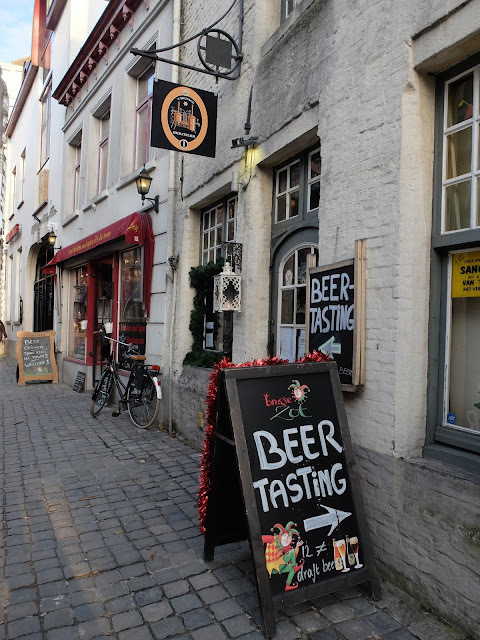 And it's a great way to see all the cute little areas of Bruges. They're pretty cheap and run from several spots along the main canal. And is about 75% cheaper than a gondola ride in Venice! - De Garre is this tiny little place down this tiny little alley. Get the triple, it's their specialty! And it came with a side of cheese. Any beer that comes with a side of cheese is a win in my book. 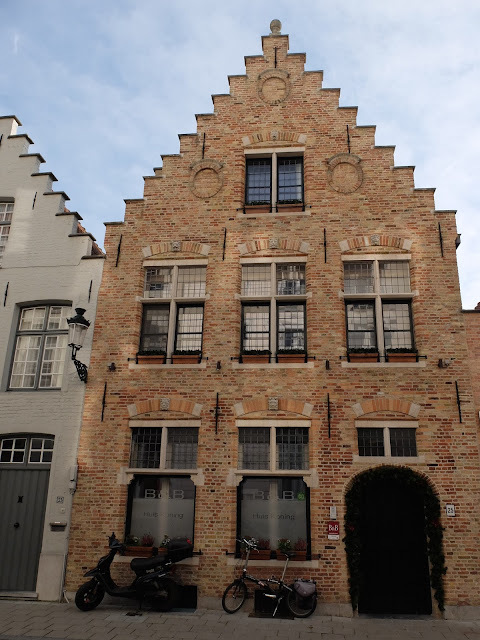 - De Halve Maan Brewery is the oldest still running brewery in Bruges. They offer a daily tour and have a food/drink menu to keep you fueled for the day. Just a few of my favorites. I have to say, going at Christmas time was extra charming, everything was sparkling with lights and trees! Plus they had a cute little market set up in the town square. I loved it. Oh, my Bruges. We will meet again. 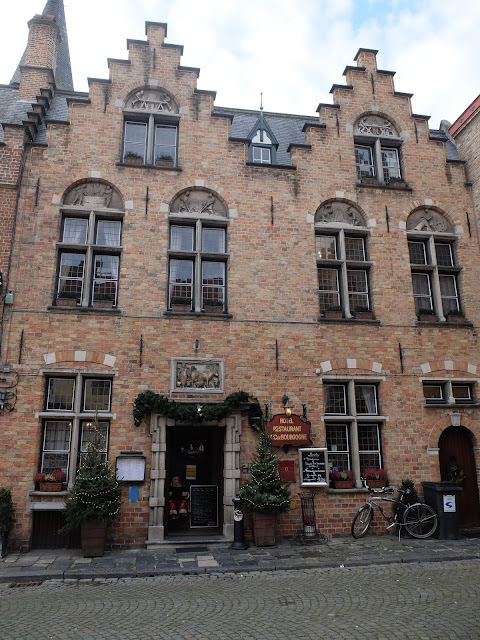 Have you ever been to Bruges? This is pretty close to what I brought with me to London, Bruges, and Copenhagen. I didn't include my underthings or 1 pair PJ's, but that's all the clothing that was in my bag. I didn't even go roller board suitcase, we opted for our backpacks, because after you go over about 5 cobblestone streets you'll be SO GLAD you're not rolling anything. (This is the bag I have and I LOVE IT!) Plus, three of these eBags packing cubes fit perfectly and carry everything we need! I can honestly say I wasn't sick of these clothes, which is amazing. These 5 tops vary in weight, color and warmth. Black tank and grey t shirt can be layers or worn alone. The three sweaters have varying sleeve lengths, different types of knit, etc. I only ended up wearing the black jeans. For some reason once I pack those burgundy pants, I never want to wear them. Not packing them anymore! We were able to wash our clothes 1/2 way through the trip, so this wasn't a problem. This was really 1 coat, and 1 kind-of-jacket that's more like a cardigan. It was more to change up my layers, as it wouldn't keep you warm below 75* weather. I was a little sick of my 1 black coat, but it was keeping me very warm and dry, so I stopped being sick of it and was just thankful I brought it! 1 everyday and 1 running shoe. Last year I brought 2 pairs of cute shoes to Italy and I never wore the 2nd pair. I decided to stick to one pair that would cover all sins - and it worked great! These have just enough of a heel that they looked dressed up with a nice necklace and my dress. This dress is a favorite of mine over tights, and it worked for our few nice dinner nights. I could also layer sweaters over it for a casual daytime look. This is a milestone for me - i love bringing millions of scarves, but I stuck to 2! I kinda wish I brought 3, since it's basically the only thing you see in our photos except my jacket, but I also thought I might buy one while we were there and thought i'd save my space. At the end of the day I love these two fun scarves and thought they were great choices. Also, wish I would have brought 1 more beanie. I kind of brought it thinking I would use it 1 day, if even - but I wore it almost every day because of all the rain! My grey fingerless gloves were perfect for the whole trip. They're from H&M and my favorite! Biking in Copenhagen, going for a run in a park - glad I had a set. These were great for my dress and also to add a layer of warmth under jeans on a chilly day. You'd be surprised how warm tights can be! Just a few outfits - unfortunately, you can't see what's under my jacket half the time. But with different hair styles, lipstick, and switching up scarves and beanies, you can get a few different looks without bringing your whole closet with you. Two weeks carry on only in Europe in the COLD - you can do it!